Guest post by Edmund Hart, a #SciFund Challenge participant from the University of British Columbia. why can’t it create some famous scientists? Both traditional funding venues (NSF, NIH, etc…) have shortcomings, some of which #SciFund can circumvent, but #SciFund has a few pitfalls as well. So let me share some thoughts. 1. Can you spare a quarter? If you’re submitting a proposal to #SciFund, you probably don’t need much money. If you’re a graduate student, post-doc, science hobbyist, research associate etc… you may just need a few thousand dollars. A #SciFund can let you get that extra monetary push to do something cool without having to wait for a grant cycle. The NSF won’t give you $2,000 for those extra consumable, but maybe all your twitter followers will. So even if you don’t get that DDIG (NSF Doctoral Dissertation Improvement Grant) you can still potentially get that cool addition to your dissertation off the ground. Speaking of twitter, facebook, linkedin (maybe even Friendster?) if you have an existing social network you can leverage it to fund a #SciFund proposal. This of course only works if you’re on twitter already and have that blog with 200 followers. And if you don’t, well you may be left out in the cold. Here’s an analogy. Last week I hosted an apple pie baking contest judged by everyone at the party. We had 20 pies in a small apartment and had to put them all in different rooms. But the main living room was where everyone was hanging out. Now that means everyone had to taste 20 pies and that is a lot of pies to eat. So what pies were the highest ranked? All the pies in the main room in front of everyone of course. If your proposal is going up against someone who is a guest blogger at SciAm and has 500 twitter followers, sorry your project is already way behind. At the NSF you know your proposal will get read and seriously considered, but not the case for #SciFund. Does this mean you should despair? Of course not! It just means you should consider the advantages of creating that online social network. 3. Look at me I’m on YouTube! Let’s face, it any traditional proposal is not very fun to write. They are long, take lots of work, and maybe you’ll spend months on that grant and it all goes down the drain. #SciFund proposals have videos, pictures, and don’t need to be rigorously cited (but should be). The flip side of this is that you leave yourself lots more work to do during the writing phase of your manuscript. As annoyed as I’ve been having to work on that long NSF proposal, I have always loved how fast I can write the manuscript afterwards. You’ve already got lots of the groundwork done with all your citations and if you did what you said you were going to do you basically have your methods section written. With your #SciFund proposal it’s a different medium and I’m guessing PNAS doesn’t accept submissions in the form of YouTube clips. The advantage is that if your #SciFund proposal doesn’t yield much money, well at least you didn’t work on it for two months day after day. If it is funded you’ll have lots of useful materials for connecting with the public and already built those relationships and won’t that make an awesome Broader Impacts section? Ok so I’ve saved longest winded for last and this is the one I probably struggle with the most. Claude Shannon is one of my favorite scientists. Maybe you haven’t heard of him, but every ecology undergraduate at least has heard of the Shannon diversity index. If you don’t know who he his, well fire up wikipedia and then pour some of your 40 out for him because if he wasn’t around you wouldn’t even have an internet to look him up on. Claude Shannon is best known for developing information theory and that allowed for all the digital devices and circuits we love so much today. But I doubt in the 1930’s and 40’s while he was developing information theory anyone would have been able to predict what it would lead to. And that’s probably the biggest challenge you face with you #SciFund proposal: marketing. Basic research is an easier sell to large traditional granting agencies. A previous post by Jeffrey Bodwin makes this point as well. To paraphrase him, you need to show how your science can cure cancer, make a better widget, and what about those jet packs we were all promised. 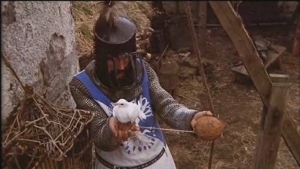 The sad truth is most of us won’t cure cancer, don’t know what a widget is and if we could make jet packs some annoying ecologist (I can make this joke I’m an ecologist) starts complaining about how jet packs interfere with the air velocity of unladen swallows. Maybe something we do now may lead to those things or other awesome applications, but most scientists are just after knowledge. But that’s what’s awesome about science and its iterative process right? I mean how cool is it that Charles Babbage laid the groundwork for computers 100 years before they existed? So we’re left either telling bald faced stretched truths to market our science or left in the cold. I can imagine crowd funding basic non-applied science is going to be hard. Not to mention just because something is flashy and makes a cool YouTube video does not mean it’s good science. At this point you’re saying: “Uhhh Ted this is not supposed to be an NSF cheerleading blog.” Well here’s flip side. Traditional funding agencies like success; they aren’t necessarily the breeding ground of innovation and paradigm shift. And that’s what makes #SciFund really amazing. Just like those record labels wouldn’t give Clap Your Hands Say Yeah and they took it to Myspace, #SciFund can take an idea that’s really innovative, a long shot the NSF won’t touch and get it off the ground. Both traditional grant writing and the #SciFund offer advantages and disadvantages that require different skill sets. A traditional grant can be very hard to get and probably isn’t worth the work if all you need is a small amount. The advantage though is that you’ll already have the groundwork for a manuscript laid, and you’ll most likely get a fair reading. The down side is that you’re still stuck in the ivory cage of academia and you won’t have any out reach materials. You don’t have to market yourself quite as much, but at the same time you can’t present anything too radical. A #SciFund proposal will help you connect to the public and can give you rapid access to small starter funds. You’ll have to do something to make your proposal really stand out. My idea was to make my proposal about beer which while interesting and marketable really won’t contribute anything to further science and could take money away from a more important proposal that maybe doesn’t have the broad appeal of beer science. But you’ll need more than just a flashy well marketed idea, you’ll need the social network to bring people to it. One mention on the Colbert Report would bring you more money than the flashiest proposal in the basement of RocketHub. So if crowdsourcing is an avenue you’re interested in, get working on building that online social capital if you don’t have it already. MURKED! You put a picture from the Dave Chappelle Show “Wrap it Up” Skit. That’s all I need to see to support #SciFund. Whatever you need, let me know. I’m your girl!